The second of four official training runs for Five Peaks. The Five Peaks SA Trail Running Festival on April 7 will have something for everyone with four distances featuring a mix of wide open fire trails, technical single track, native bush and stunning views. 8 km, 12 km, 23 km or 58 km. Click here for more information on the April 7th event and to enter. This training run is the first section of the 58 km course – approximately 18 km from Athelstone to Norton Summit. There is also an informal 9 km option, returning to Foxfield Oval along Montacute Road. The Montacute Road section will not be marked. 18 km runners – meet at Norton Summit at 6:15 a.m in order to car pool to Athelstone for a 7:00 a.m start. 9 km runners – meet at Athelstone for a 7:00 a.m. start. Your volunteer leader for this run is David Close. This is a free “social run” – for more information on what to expect at a social run, click here. Mal and Merry, our wonderful volunteers who provided the amazing spread at our Belair training run, will be waiting for you at Norton Summit in front of the community centre with a delicious array of food again. The course will be marked with the exception of the Yurrebilla trail but ‘Follow Yurrebilla Trail’ signs will be at these junctions and you should then keep an eye out for the standard Yurrebilla trail markers. Click here for directions in google maps to the Athelstone Start area. Click here for directions in google maps to the Norton Summit 19km finish area. Please do not park in the Scenic hotel as this is reserved for paying customers. We are relying on people to car pool so please head to Norton Summit and co-ordinate rides down to Athelstone from there. 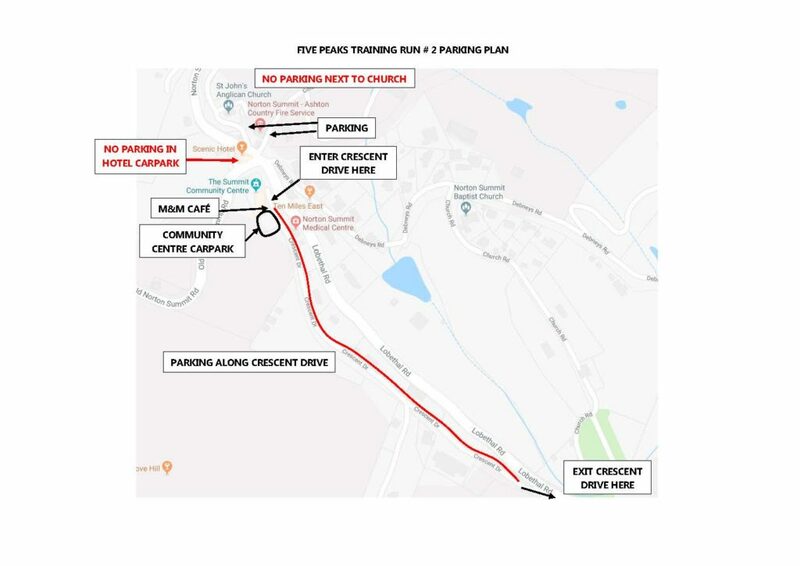 Please see the map below for instructions on parking at Norton Summit to minimise congestion and the impact on other people in the area on Sunday morning.